Client: Shanghai World Expo Development (Group) Co., Ltd.
Programme: New headquarters for the New Development Bank in Shanghai, China with 80,000 m2 above ground, 40,000 m2 underground, height 150 meters; 60,000 m2 office space, 9,600 m2 meeting space, 14,400 m2 service space, including library, restaurant, gym, archive center, safe room and 4 floors underground parking. The new NDB headquarters integrates modernity and innovation with cultural tradition in order to create a classical yet exemplary headquarters design for the surrounding area. In the current globalized world, we believe finding personalized solutions to unique problems are of high pertinence and value. The iconic tower sits in harmony with its surrounding context; the shape and form responds to the diversity rendered in the site and the headquarters takes a different shape from every angle as you approach. This sensitivity to the site reflects the values of the NDB to become a transparent institution highly conscious to the changing world. 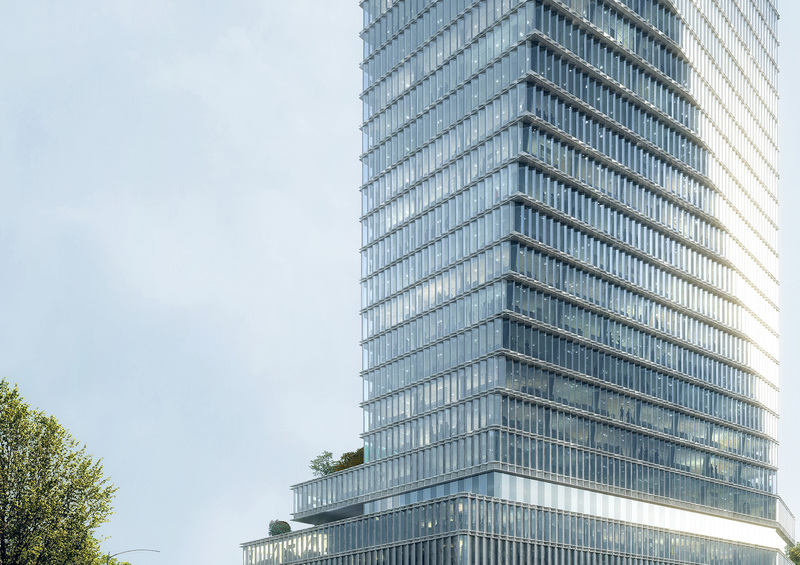 The multifaceted identity of the tower is also manifested in its facade design. Integrating the latest innovative technology and solid passive design methodology in sustainability, the marble and glass facade is designed to overcome various environmental concerns, especially solar radiation. The south and west facing façades become more closed, while the north facade fully opens up. Our recent experience with major economic institutions has taught us that functional hierarchies are key. We have split the building into 3 main functional zones: the lower plinth containing the common areas which require big open spaces, the offices situated in the body of the tower, and the head of the tower containing the board room and presidential area. By restructuring the complex programs into three distinct zones, the resulting spatial relationship is expressed in the buildings form.